I’m finally getting back to my proper reading habit/schedule. I’m trying to read 24 books for 2009. I tried another John Maxwell book. Even Psycho-Cybernetics started out with a promise. Yet I seemed to have gotten myself in a lull after speeding through 4 books early on this year. So I decided to go to a classic. Someone whom I’ve always enjoyed reading. Og Mandino. He has a way of combining words together on paper that makes me want to continue reading well into the night. Only Malcolm Gladwell, recently, has done this for me. So I turned to his classic, The Choice. The Choice is a timely book. During these days of economic uncertainty and the pressures of choosing between financial survival (as we add a third job to our already hectic schedules) and family stability ring true for many people today. This is not the theme of The Choice. In this book, we find a very successful breadwinner having to choose between the principles he believes in and teaches or succumbing to a life-altering decision. With Father’s Day right around the corner, I highly recommend that father’s pick this book up today and start reading. What book did you just finish reading? 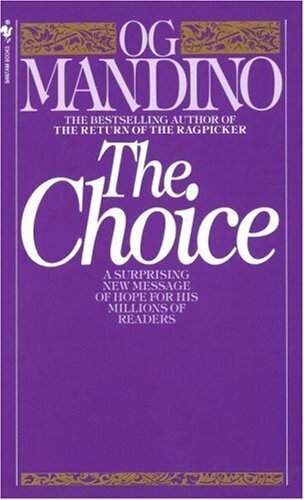 I would love to hear your thoughts on what you’re reading and if you’ve read The Choice, did you enjoy it?